Sarah says Freedom Foods Group reviewed various coffee destinations for the prize destination, but kept coming back to Vietnam. “Vietnam is the second biggest producer in the world, it has a focus on Robusta development, and is a desired destination, not just as an important coffee destination, but as a tourist destination,” she says. To make that dream a reality for one talented barista, Freedom Foods Group wants to expand its competition reach to baristas Australia-wide. As such, the company’s dairy and plant-based milk alternative brand Milklab, invited baristas to upload a video of their most creative latte art using Milklab’s products (excluding its dairy and lactose free products) with the hashtag #milklabbaristabattle and tag @Milklabco. The four winners, as judged by a Milklab panel, won flights and accommodation to attend MICE, and the chance to compete in the Barista Battle Series Final. “The four winners were chosen based on their latte art creativity and how well the design was presented in the cup. It’s designed to texture and stretch to the high standards of baristas. The competition Quarter Final, Semi Final and Final will take place at 2pm on Friday 8 February on the Milklab stand #107 at MICE. During the three final stages of the competition, a panel of judges will judge the designs based on criteria of creativity and a harmonious balance of rich, sweet milk and espresso, and critique the latte art based on visual foam quality, contrast, harmony, size, position, and creativity. The competitor with the fewest points will be knocked out at the end of each round. 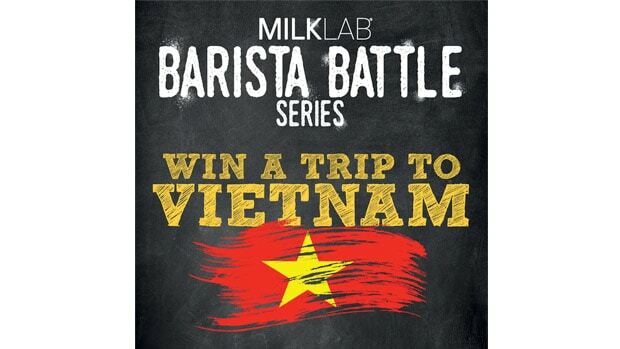 The winner of the Milklab Barista Battle Series will be the barista with the most awarded points during the final round, as judged by three industry experts. In addition to the Barista Battle Series, Freedom Foods Group will also host the Barista Social Club at MICE. The Club will offer a space for ASCA barista competitors to relax and practice ahead of their events. “We’re working hard on making it more than just an educational and interactive space, but a funky lounge with plenty of activations to interest baristas,” Sarah says. On its stand, Milklab will showcase two new Milklab products in development. Milklab invites baristas to taste, test, and give feedback on the new milks with the objective to get to an industry-validated product ahead of their official launch. Sarah says the Milklab Barista Battle Series, Barista Social Club, and collaboration opportunities are just a few of the many ways the brand is working directly with specialty baristas and roasters to gain product feedback and perfect beverage solutions. “Collaboration with baristas is key to the Milklab brand. We’re designing products especially for them. If we can support them in their journey and aid their understanding of how to best use Milklab products for their audience, then we’ll continue to do that,” Sarah says. This article appears in the 2019 Melbourne International Coffee Expo Showguide.